In an age when educational institutions call for sharpening critical thinking skills, the corporate and state media scribes show a paucity of critical thinking. It should be apparent that when a journalist, anchor, reporter reports on a claim s/he has an immediate first duty to verify factuality by demanding evidence to back any claims. Do these media people purchase bridges in Brooklyn without checking the deed of ownership? Wikileaks published evidence of the war crimes carried out in Iraq when it released the “Collateral Murder” video of US military in an Apache helicopter shooting an unarmed group of adults and children. Julian Assange is the founder of Wikileaks, and as such has been identified as an enemy of the governmental-media-military industrial complex. Sexual allegations were raised against Assange in Sweden, but he was never charged, and the case was closed by Sweden. Assange was on record as willing to go to Sweden and face the allegations, but he could not receive a guarantee that he would not be turned over to the United States. Britain keeps him confined to the Ecuadorian Embassy, what a United Nations panel calls “arbitrary detention,” with the threat of arrest and likely extradition. I wrote an article last summer that cited reports that Ecuador’s president Lenín Moreno was about to renege on asylum that the government of previous Ecuadorian president Rafael Correa had granted Assange. Now the specter of Assange being evicted from the Ecuadorian embassy is again at the forefront of news. The Associated Press wrote that Moreno complained that WikiLeaks was intercepting his communications and invading his privacy. Importantly, AP noted that Moreno provided no evidence for his claims. Assange’s “great crime” is revealing the crimes of US empire. War is peace. And revealing the crimes of Empire is deemed criminal by Empire. Others, not beholden to Empire, but followers-of-conscience are indebted to Assange who as a publisher, performed a massive service to humanity by informing people about acts their governments are involved in, support, or are silent about. WikiLeaks respects “our” right to know. It allows us to know of corruption and criminality in our governments so that society can organize to denounce and put an end to such corruption and criminality. Julian Assange and his colleagues in Wikileaks have shown on numerous occasions that they are one of the last outlets of true democracy and their work for our freedom and speech. Their work for true peace by making public our governments’ actions at home and abroad has enlightened us to their atrocities carried out in the name of so-called democracy around the world. This included footage of inhumanity carried out by NATO/Military, the release of email correspondence revealing the plotting of regime change in Eastern Middle countries, and the parts our elected officials paid in deceiving the public. This is a huge step in our work for disarmament and nonviolence worldwide. After criticism for awarding the prize to dubious types such as Barack Obama, the Norwegian Nobel Committee is being pressured from Nobel Peace Prize Watch to adhere to Alfred Nobel’s testament and his anti-militarism. Such an award may be the Nobel committee’s greatest opening to celebrate Alfred Nobel’s legacy and garner new luster for the Nobel Peace Prize’s tarnished reputation. 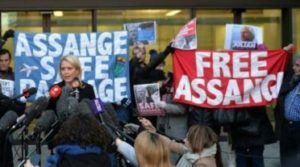 A Nobel Peace Prize should confer some kind of protection and immunity from further political persecution should Assange leave or be forced to vacate the Ecuadorian embassy — should it not? What kind of embassy would kick out a Nobel Peace Prize winner? And would Britain arrest a current Nobel Peace Prize winner? And would the Trump administration seek to persecute a Nobel Peace Prize winner given that Trump has been pining for his own Nobel, risible as that sounds. Despite Assange’s sacrifice to humanity, he has ruffled the feathers of the power structure. Again, it is clear that Assange must be protected. The Nobel committee must come through for humanity and for peace. People power needs to mobilize. If people care deeply about their right to be informed, to be apprised of their government partaking in war crimes, then millions must take to the streets and squares, especially in Norway and Britain. This article was posted on Friday, April 5th, 2019 at 2:54pm and is filed under Ecuador, Julian Assange, Media, United Kingdom, WikiLeaks.